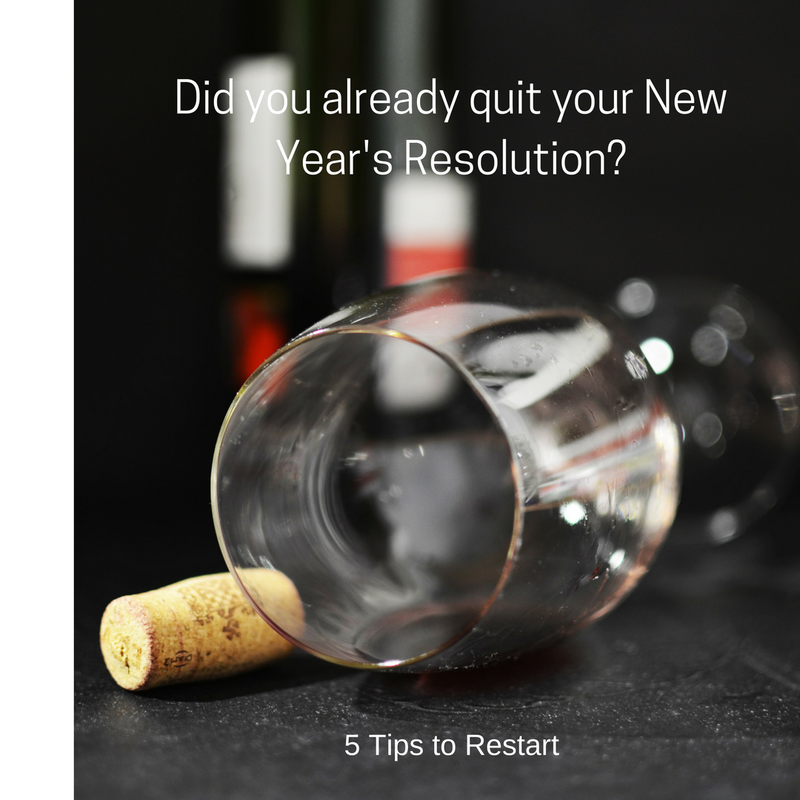 5 tips to restart Your resolution. Everyday can be January 1st! You were ready to make the commitment. You heard all about how going Paleo will make you bulletproof. It was the New Year and you made the resolution. This year you were going to stick with it, not like last year. Fast forward three weeks and you’re back having lunches at Taco Bell and you just couldn’t skip the breadbasket when you went out with friends over the weekend. Paleo is a great way to add nutrient-dense foods to your diet that can lead to weight loss when you replace the junk. Before I started on my health journey I didn’t think that food affected how I felt. Now I know that the food I eat provides information to my body. By avoiding foods like gluten and dairy my mood has improved, I lost some weight and I went from taking three daily medications for allergies to barely experiencing symptoms and only once or twice a year when I did. I get it. You’re already overworked. How can you possibly add preparing healthy Paleo meals to your already schedule-full day? Fear not my friend, creating a healthy lifestyle is not a one strike and your out game. You may screw up from time to time but you only fail if you don’t try again. January 1 isn’t the only day you can start a resolution. You can get back to it now and these 5 tips can set you up for success. The biggest time commitment in going Paleo is planning your meals and doing the shopping. The Internet is full of Paleo recipes, so just start Googling. I’m a huge fan of Simone Miller from Zenbelly. Her recipes are easy and will wow anyone you have over for dinner but there are so many recipes and meal plans out there. Just pick one and try a few. Figure out your meals for the week, make a list and go to the store. This will get easier with practice and as you figure out what you like. If recipes are too time-consuming or not your bag you can create a simple meal with a bit of meat and a side of veggies. Just make sure you have food in the fridge so you aren’t tempted to call for Indian delivery (ask me how I know). There are also great Paleo food delivery services. Everything from frozen dishes you can heat up to a box of ingredients you prepare at home. These are hard on the wallet but might be a valid option during the transition to a new way of eating. It seems that the art of cooking is becoming extinct. Our mom’s cooked in microwaves and we never learned how to prepare a proper meal. When I first started eating healthy I was not a great cook. It takes practice. Luckily, every meal you make is that practice and you get better the more you do it. Get a knife and learn how to use it! Paleo forces us to learn to cook and the first step is to buy a proper chef’s knife and learn how to use it. Cooking is no fun if you struggle to chop every ingredient. There are plenty of knife skills videos to watch on YouTube but the only way to get good is to practice and you practice by cooking. Until you get up to speed or just to save some time, you can always buy precut veggies at the grocery store. This is a huge time saver but will cost more than veggies in the produce bins. Don’t let that stop you if you have more money than time. Going 100% Paleo in one step can feel like an insurmountable task that may set you up for failure. You can set priorities and take steps in the right direction. Each success will keep you motivated and moving toward your goal. First, ditch the industrial seed oils first. I often say to use up what you have and buy something better the next time. This is not the case when it comes to oils like soy, safflower, canola, and “vegetable”. Just get rid of that junk and replace it with real olive oil, avocado oil, coconut oil, and butter. Avocados are a great source of healthy fats and fiber. Next, eat high quality, pasture raised meat and eggs and wild caught fish. This may seem expensive, but remember, a serving size of protein is 3 ounces so a little bit goes a long way. Finally, getting off every kind of bread can seem daunting when you’re used to eating bread at every meal. Transitioning to Paleo breads can help ease the change since figuring out what the heck to eat for lunch can be challenging when we’re used to sandwiches and pasta. Eventually, you’ll learn what to eat without needing bread that may have some sketchy ingredients in it, which is why I avoid it. Don’t think of this as an all or nothing endeavor. You are learning a new skill. You are going to have slip ups when your coworkers ask you to join them for lunch at your favorite pizza place. Just don’t let one misstep be the thing that stops you. Acknowledge you made a choice that no longer serves you and get right back to your goal. I also see these slip-ups as a great time to evaluate the changes since you’ll have a better idea how you react to these foods. When you reintroduce foods once you’ve been off them for a while you’ll have a much better idea of how your body responds to them. This can reinforce your desire to stick with the plan. This is a change in lifestyle, not just a diet. While I recommend doing a strict Paleo diet for a least a month (but really 3 months is ideal) so you get a sense of how making these changes feel in your body, don’t think that you can never have certain foods ever again. You may not be sensitive to dairy and like to have a bit of cheese now and then. Or your favorite food is sushi so you eat rice on occasion. That’s ok. Just make your decision to eat it with awareness and thoroughly enjoy every bite. While the Paleo diet has a reputation for being rigid and hard to implement, preparation and a game plan will make it easier for even the busiest person. With practice, you can learn what works for you, where you want to incorporate shortcuts and where you want to pay for convenience. Cut yourself some slack when you slip up and stick to your resolution.